To transform persimmons into the luscious natural treat of Korean gotgam (or in Japanese, hoshigaki), you have to move quickly. The moment at which the persimmon is at the perfect level of ripeness for drying is fleeting. If you’re too late, the persimmons on the tree will be too soft and ripe for drying, though perfect for digging into with a spoon and eating fresh. If you’re too early and the persimmons are not ripe enough, you’ll miss out on the deep sugary flavour and texture that feels like molasses on the tongue. The skin should not be green, and when you squeeze the persimmon, it should not yield too much to your touch. Dried persimmons are a delicacy in both Korea and Japan. Last year in the countryside, I was once handed a whole dried persimmon from a temple food master, with two hands like the precious gift that it was. The persimmon was dusted in an even blanket of white, a result of the sugars rising to the surface during the drying process. The temple food master had plucked the persimmons herself and dried them outside her countryside home. Together, we each ate an entire dried persimmon silently and gratefully. This year, I was lucky enough to be invited to spend an afternoon with my friend Sonoko Sakai, who teaches workshops on Japanese cooking and is coming out with her third cookbook, Japanese Home Cooking, next year. Her first cookbook, published in 1986, has the inspiring and ever-fitting title of “The Poetical Pursuit of Food: Japanese Recipes for the American Cook.” When you meet Sonoko, and see her cook, the Zen-like poetry of her movements and presence are so apparent. I first met Sonoko earlier this year, before I moved to LA, when she taught me how to make miso and soba noodles from scratch. At the moment, she teaches classes from her home which is sunny and minimally decorated, save the elegant paintings and architectural wooden sculptures by her artist husband. And save the collection of Edo-era ceramic sake cups she inherited from her mother displayed in her living room. And save the nooks and crannies in her kitchen and around filled with her homemade Japanese ferments and condiments. Basically, Sonoko’s house is my dream house. I hope she doesn’t mind terribly if she finds me squatting in one of her side rooms, sleeping next to a shelf lined with jars of miso and pickles. 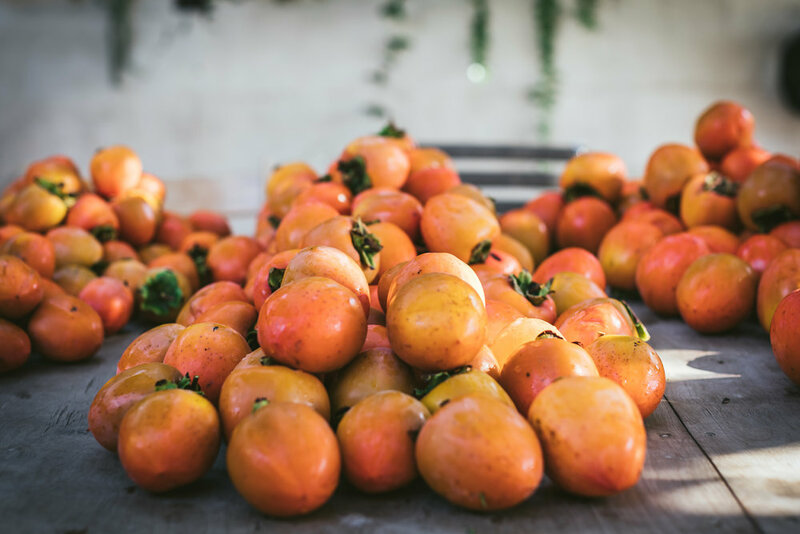 Last weekend, I brought over a box of hachiya persimmons which I had picked up from Murray Family Farms at the Hollywood Farmers Market. 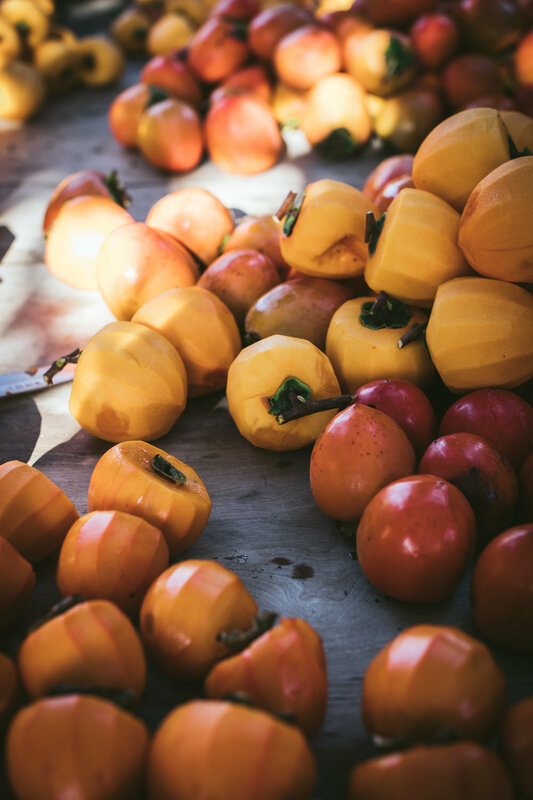 Sonoko’s husband had picked bushels of persimmons himself from a generous neighbour’s tree. Together, we had mountains of persimmons to peel and prepare for drying. It was a perfect autumn afternoon as a group of us sat outside in Sonoko’s backyard. The process is time-consuming but relaxing. Gradually, we fell silent as we worked. 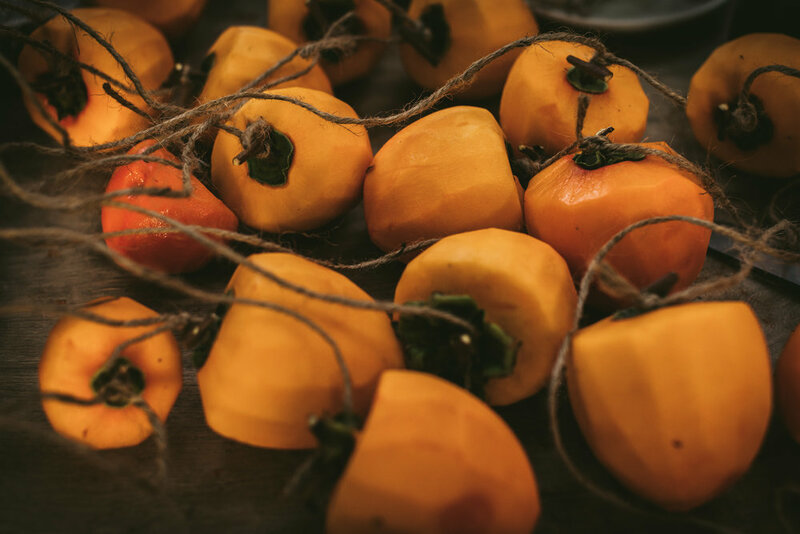 All we were focused on were the persimmons, lost in the peels which fell away in ribbons and the rough feel of the twine as we strung them. Sonoko surprised us with a plate of pan-fried gyoza which she had been hand folding while we were all outside working away. They were balanced with a bowl of quick cucumber pickles flecked with dill and pomegranate seeds. And then because the sun was shining and we had been working so diligently, we opened a bottle of sake. Everyone picked their own sake cup from a basket and we toasted to Sonoko and the beautiful afternoon. I had arrived at 2pm and by the time we were done hanging the peeled persimmons, the sun was setting. 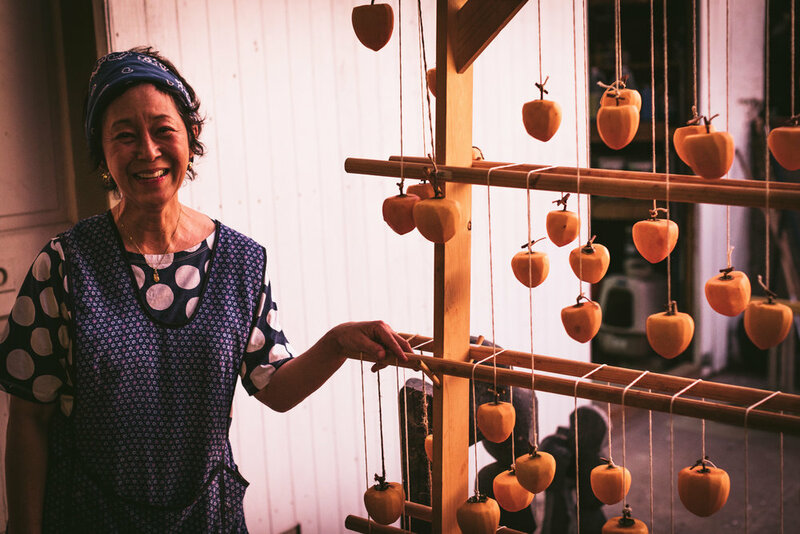 The persimmons dangled like jewels from racks that Sonoko’s husband had made for her especially for making hoshigaki. Isn’t that what everyone deserves - a man that will build you hoshigaki racks? The pressure is on for my man, K, ha! Sonoko sent me home with a box of persimmons that I had peeled and a wooden clothing rack. Now, next to my house, I have my own small rack of persimmons. After waiting for a week, I have started to gently massage the persimmons every morning. This apparently evens out the distribution of sugars so that you have an even more beautiful coat of frosty sugar on the skin. In about a month, they should be ready. Just in time for Christmas baskets and brewing a Korean wintry tea from the dried fruit and spices. Sonoko hosts workshops on making hoshigaki every autumn. While you’re waiting for next fall, you can sign up for one of her other workshops, whether it’s how to make soba or ramen noodles from scratch or how to make onigiri. Maybe you’ll be able to spy me napping behind her bookshelf, snuggling a jar of pickles. If I’m lucky. For more information on her workshops, check out www.sonokosakai.com.